You may have already discovered my apps on the Apple App Store — if not, do have a look at them. There is a list below which shows you the apps which are being issued first…. Achieving faster change. I have found that the clients who come to see me, no matter what it is for, usually benefit greatly from being given CDs, which they can use in their own time to reinforce the treatment or continue the process of change which they have already started. I teach them how to do self-hypnosis so that they can take themselves into a relaxed state and then either give themselves positive suggestions or listen to the suggestions or imagery that I’m offering them. From CDs to apps. Some of the CDs which I have given to clients have been highly specific and are suitable only for that individual, but many of the CDs have been of wider application. Anybody with that particular issue (say fear of flying) would benefit from the CD. So it seemed sensible to offer these CDs to a wider audience in the form of apps — a format which is becoming increasingly popular. Some apps may be intended to promote change which will be permanent, e.g. to stop biting your nails. You may only need to listen to this app a few times. 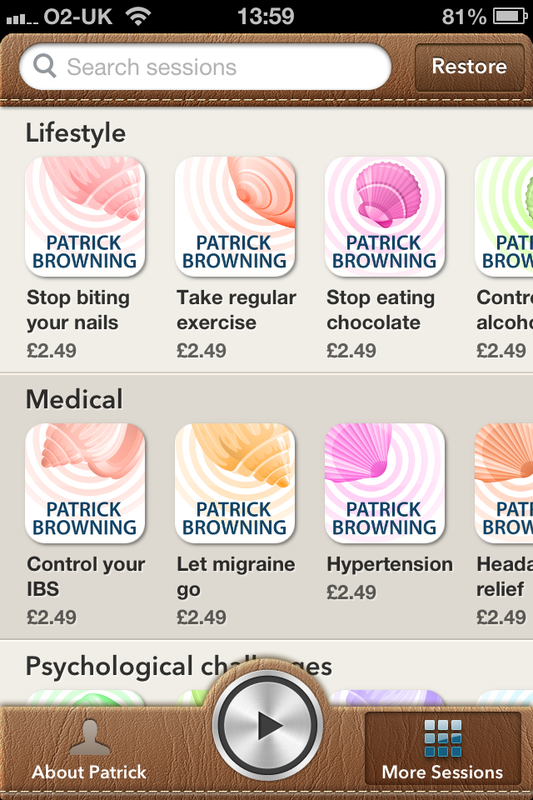 Other apps may be supportive and you may find you need to use them indefinitely in the future, e.g. to help with pain relief. You are making the change. Remember that, although hypnosis can be extremely effective, it is not a magic wand. It is important that you should want to make the change that you are seeking and are prepared to put some effort into making that change. me to speak slower and more clearly. Thank you for your e-mail and I’m so glad you are enjoying self-hypnosis. Just an update, I have been listening to self hypnosis for a while now and seen a massive improvement. I have slowed right down in my speaking and even achieved a new job. So thank you for the feedback before. Going to continue with self hypnosis and try and achieve every success in my new job and be the best I can be. Your personal needs. Do bear in mind that I do not know what your own personal needs are, and it may be that you need to see a hypnotherapist, or other practitioner, for help. 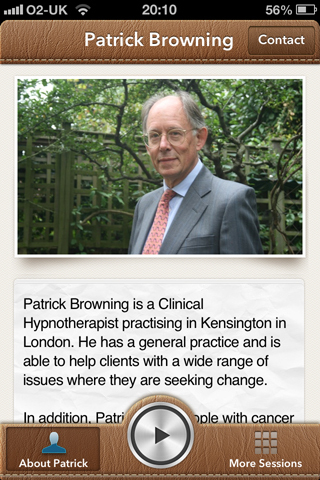 One or more of my apps may help you to consolidate the support you are getting from elsewhere. Or you can always arrange a session with me: email [email protected], or call 020 7229 0098. More to come. I’m expecting to issue more apps, to help with a wide range of issues, probably on a quarterly basis. If you do not find what you’re looking for please let me know — perhaps I can include it in the next set of releases. Relax in your garden Just relax!